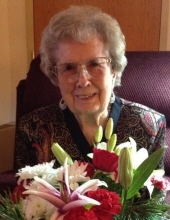 Margaret (Marge/Margie) Dorothy Jacobs, age 99, formerly of 37 N. Boardman St, Fond du Lac, passed away on Friday, April 12, 2019, at Tarfa Terrace in the Fond du Lac Lutheran Home. She was born in Beaver Dam, WI, on September 30, 1919, a daughter of William A. and Pearl H. (Steitz) Essmann. Marge graduated from Fond du Lac Senior High School in 1937. On June 28, 1941, she married LaVerne “Red” Jacobs at St. Paul’s Cathedral Church in Fond du Lac. She was employed by Infant Socks and J.C. Penney, retiring in 1981. She was a member of St. Paul’s Cathedral Church where she was a licensed lay minister, a member of St. Mary’s Guild, the Mouse Factory, Broken Bread, and Loaves and Fishes. She was a volunteer for EAA at the Convention Bureau and Docent at the Galloway House and Village. She was a voting poll worker and was a member of the Eagles Auxiliary and TOPS. She has been a resident of Tarfa Terrace since 2013. Survivors include her daughter and son-in-law, Sandy and Bob Pagel; three sons, Gary and Linda Jacobs of Lomira, Robert Jacobs and William Jacobs of Eagle River; ten grandchildren, Christy and Brad Wasieleski of North Fond du Lac, Jeremy Pagel and Andrew Goldsby of Madison, Tanya and Jason Heimke of Neenah, Jessica and Rick Pribnow of Lomira, Kim and Jerry Golla of Fond du Lac, Kelly Jacobs of Oshkosh, Kory Jacobs of North Fond du Lac, Jason and Wendy Jacobs of Rosendale, Joe Reinhardt of Sheboygan, Jason and Peggy Reinhardt of Fond du Lac; fifteen great-grandchildren, Colton and Carson Wasieleski, Addyson Heimke, Sydney, Avery, and Riley Pribnow, Fischer, Porter, and Thatcher Golla, Casey Jones, Emily, Micheala, and Chase Jacobs, Keagan and Parker Reinhardt, Chris Hafemann; one brother, Harvey and Terry Essmann of San Antonio, TX; special friend, Dan Bauer of Missouri, and Amanda Jacobs of Oshkosh; and many other relatives and friends. She was preceded in death by her parents; her husband, LaVerne “Red” on June 13, 1990; two sisters, Ruth Kastorff and Dorothy Kollmann; two brothers, Robert Essmann and Albert Essmann; one daughter-in-law, Sandy Jacobs. Visitation will take place on Tuesday, April 16, 2019, from 11:00 AM until 2:00 PM at Uecker-Witt Funeral Home, 524. N. Park Ave, Fond du Lac, WI, 54935. Funeral service will follow the visitation on Tuesday at 3:00 PM at St. Paul’s Cathedral Church, 51 W. Division St, Fond du Lac, WI, 54935. Burial will follow the service at Avoca Cemetery, Oakfield, WI. We would like to thank the staff at Tarfa Terrace, Marquardt Hospice, and Lakeland Care, for the great care and compassion they have given. A special thank you to Roger and Marie Funk for their weekly devotion bringing in the Holy Sacrament. Marge was a very loving and giving woman! She enjoyed life and lived it to the fullest. Her LOVE will continue on through all the lives she has touched, especially her family and friends. Memorials may be directed to St. Paul’s Cathedral in Margaret’s memory. To send flowers or a remembrance gift to the family of Margaret Dorothy Jacobs, please visit our Tribute Store. "Email Address" would like to share the life celebration of Margaret Dorothy Jacobs. Click on the "link" to go to share a favorite memory or leave a condolence message for the family.